I have no idea what species these mushrooms represent. And I wish 1) that I knew and 2) that the variety is edible because last fall these things were growing all over the elm trees in my yard, and in the wood ringing my house. These pictures are from late in the year – October, I believe, and after we had some frost. I’ll pay more attention this year, because I have no doubt I’ll see them again. They’re big and meaty. A really solid mushroom. Anyone care to point me in the right direction? 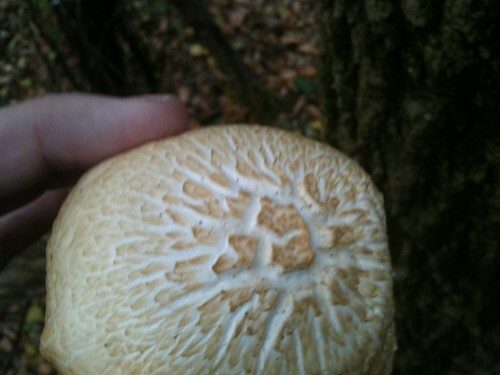 Whitish cap, with distinctive crackling across the top. Pale amber gills that do not extend down the stem. Big, burly stem that has a bulbous flare the bottom. Irregular shape – they don’t seem to be uniformly round. However, the stem is pretty much centered. They are (very sadly) not oyster mushrooms. Very sadly. 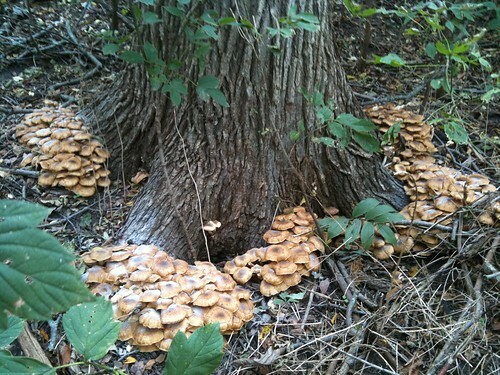 I’ve identified these mushrooms – they are Elm Oysters, edible but not super choice. They’re good steamed and then pickled, as they have a firm texture that holds up to that treatment. Note that these are best young, and the pictures in this post show aged specimens. 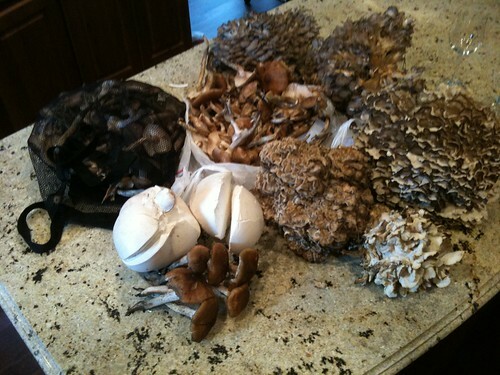 As always, thoroughly identify mushrooms before eating! Reports of morel harvests in southern Illinois have started to roll in, inflaming the imaginations of shroomers in northern climes. Mayapples. 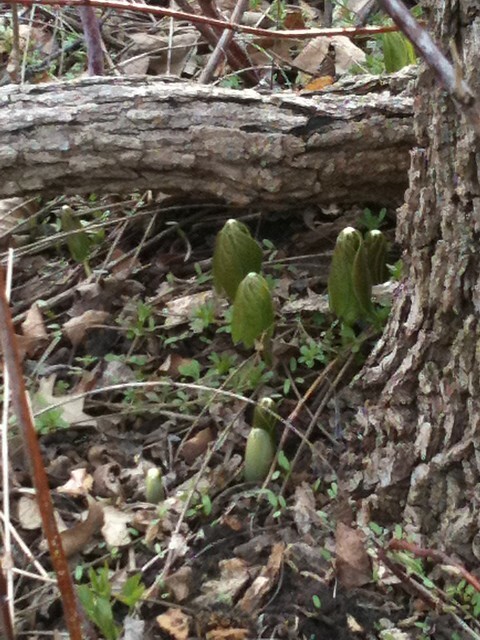 Immature, baby mayapples - weeks away from blooming. But it’s not time yet. Not up north. A good rule of thumb, people say, are mayapple blooms. I spotted these babies last weekend – and we’re weeks away from blooms. Up here, morels happen in May. 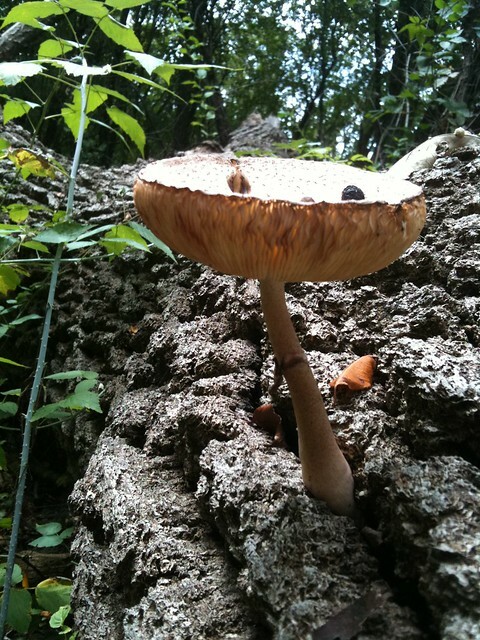 An American Parasol mushroom. I think. 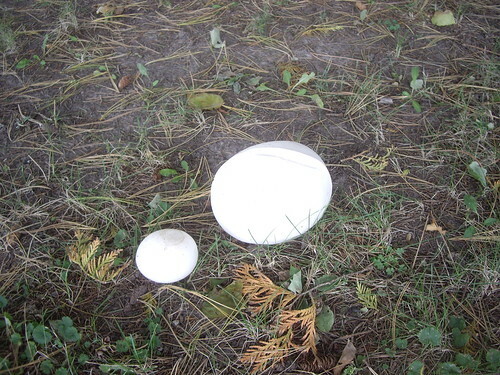 Early last fall I found a stately white mushroom sprouting from a fallen oak tree. It had some berry seeds (wild cherries?) 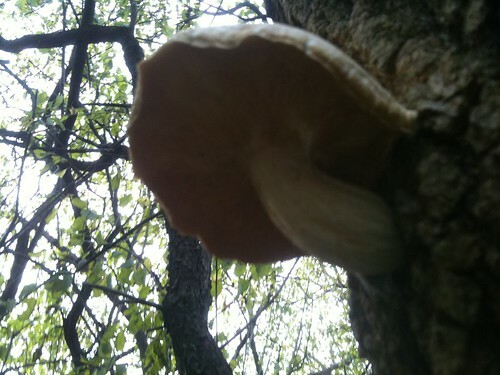 lodged on its cap, possibly dropped by squirrels dining in the canopy above. The prior week, I had seen a snowy, glowing forest fungi. I am pretty sure that was a fabled Destroying Angel, which, as you might guess from the name, doesn’t agree with human digestion. At all. I didn’t get a picture. It was beautiful, and weirdly tempting. But I knew better. 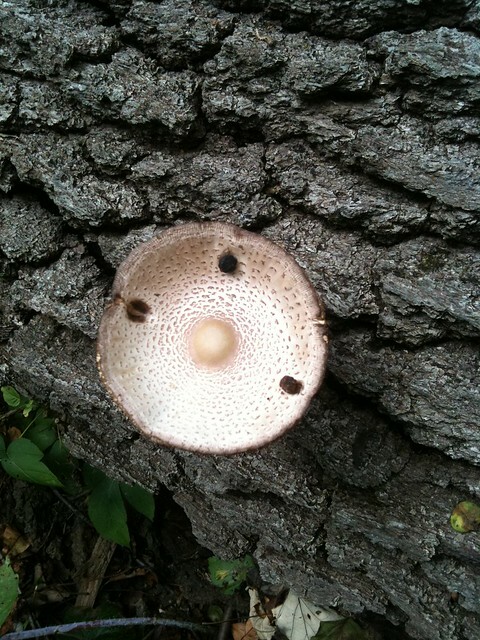 A distinctive raised 'button' in the center of the cap *may* indicate this is a Parasol mushroom. 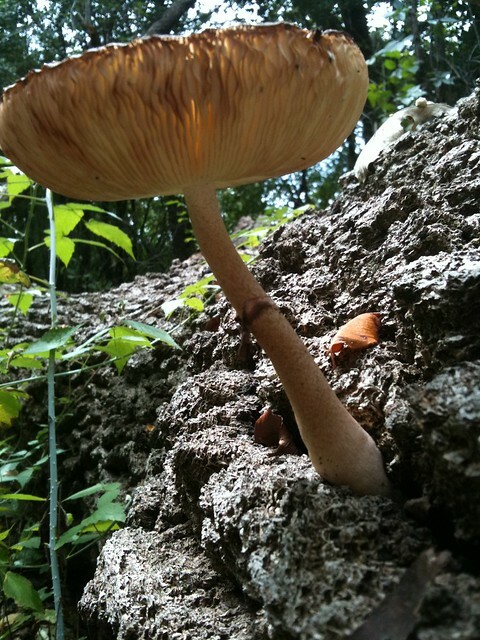 Now standing in front of another whitish mushroom, I was sure I was looking at something different. I’m pretty sure it was some form of Parasol mushroom. It had a distinct button in the middle of its cap, which was raised, and darker than the rest of the cap. 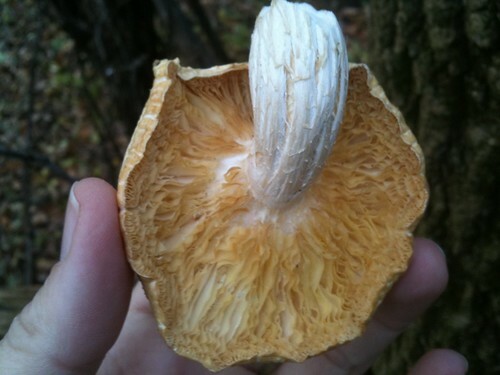 It had the characteristic bulbous flare at the bottom of the stem. Unlike the Destroying Angel from the prior week, it wasn’t snowy white. But that really is meaningless – a rainstorm can sully a pristine specimen, which is one reason why I don’t go just by color alone. 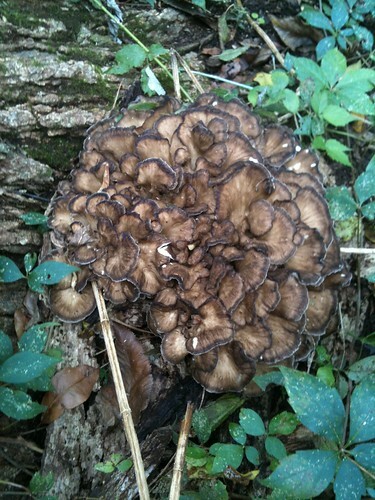 A better look at the mystry mushroom's gills. I’m fairly sure it was a Parasol. But I left it behind. It wasn’t terribly fresh, it was the only mushroom I saw that day, and, well, I wasn’t sure. Had there been a few, I would have collected some, and I would have identified them rigorously with spore prints and other criteria. I know where that log is. Maybe a cluster of Parasols will await my definitive identification there this fall, giving me another chance. But I’ll probably pass on them this year, too.